Although there was a reading room established on the main street of Perth in the 1800s which featured current newspapers, books and periodicals, it wasn’t until the beginning of the twentieth century that a formal library building was constructed. With the help of a large donation from the Andrew Carnegie Foundation, public, along with municipal and private funds, a library was built and opened to the public in 1907. 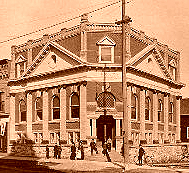 The Perth Library was one of five libraries in Ontario that was built using grants from American philanthropist Andrew Carnegie. Constructed from local rock and brick, the library was an impressive three story building gracing Gore Street near the Tay River canal. On January 3rd, 1980, flames tore through the building. It was said at the time that the fire likely began in the basement. Water soaked books smoldered in the gutted building and nothing could be saved. Over 62,000 books along with maps and historical documents were lost. I recall the eerie sight of the building, familiar to so many of us, appeared like an ice castle because of the frigid temperatures, and the tremendous amount of water used to fight the fire. It was a devastating loss to the town of Perth having been one of the loveliest buildings on the main street for so many decades. Other local libraries donated books and these were housed temporarily in the basement of McMartin House and plans were quickly put into place to establish a new library. 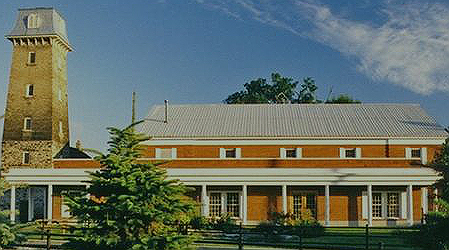 The present library, on the corner of Herriott and Drummond Streets, was opened in late 1981. 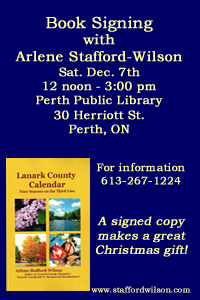 This entry was posted in Author Events & Book Signings and tagged Arlene Stafford-Wilson, Book Signing Perth Ontario, Lanark County books, Lanark County Calendar Perth Library, Perth and District Union Public Library, Perth public library. That’s so sad about the fire. Where was the original building? I was living in Toronto until 1981. The original library was at the corner of Gore St and Basin St. It was a great location, and not far for us to walk from the Perth High School. It was very shocking for us to see it in the days that followed the fire. The entire building was coated in heavy ice from the water that had been sprayed on it while they were fighting the fire. My friend’s cousin Harold Jordan was the Fire Chief in Perth at that time and his team of men did all they could, but were not able to save the building.